Learn orange nutrition and how to add the benefits of oranges in your life! Orange Nutrition – Get the Benefits of Oranges Every Day! Orange nutrition is not only delicious, but is a healthy alternative to processed snacks. With origins in Southeast Asia, few people know that an orange is actually a type of berry. While the juice of an orange is used to make orange juice, orange preserves and various extracts, as much as 20% of total orange crops are consumed as a whole fruit. Loved because of its sweet, juicy flavor and the rich vitamin C content, the benefits of oranges makes it as popular a fruit for fruit smoothie recipes as it serves as a healthy snack. Not only is orange nutrition a great source for vitamin C, but the benefit of oranges also provide an excellent source of vitamin A, B vitamins, calcium, folate and potassium. Because oranges are also rich in a type of flavanone, known as herperidin, they are also helpful in bringing high blood pressure levels down, lowering cholesterol, and reducing risks of heart disease. 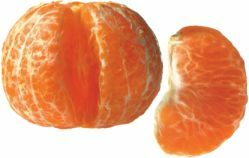 The highest concentration of herperidin is found in the white pulp of the orange, which is often lost during juice processing as this part of the orange is removed. As a strong antioxidant, vitamin C is very useful in combating various types of cancer, high cholesterol and inflammatory conditions, like arthritis and asthma. Vitamin C is also a very worthy immune booster and helps the body fight against the common cold. Because the vitamin is more strongly concentrated in a whole orange, eating the fruit, or even juicing it at home, is more effective than taking a vitamin C supplement. Further, research strongly indicates that the body has a greater absorption rate of the nutrients within an orange when it is consumed as a whole fruit, rather than as a supplement as the nutrients in the fruit also interact with the more than 170 other phytonutrients and over 60 other flavanoids that are present in a single whole orange. The inner parts of an orange are not the only to carry extraordinary health benefits. The benefits of oranges and their cholesterol lowering flavones are also found in the peel. These flavones are potentially more powerful than statin medications commonly prescribed to help lower cholesterol. While many believe orange juice has the same effect, it takes as many as 20 glasses of juice per day to receive the same amount present in the orange peel. Since the peel can be bitter to the taste, it's advised that anyone interested in its healing properties simply grate a little of a well-scrubbed peel and use the essence for flavoring various drinks, salads and other dishes. Another secret to getting great nutrition from an orange is to use a paring knife to shave off the orange peeling while leaving the white pith on the orange. You can cut the orange in half and take the seeds out. Then toss the whole orange into the blender for a yummy orange smoothie recipe. And blend away! That way you can receive benefits of the whole orange! Whichever way orange nutrition is prepared; fruits should always be thoroughly washed and enjoyed often. When buying oranges, those that are grown organically are best. Note, however, that organic oranges do not always have the bright orange color that others do. That is mainly because they aren't injected with artificial coloring. Always avoid fruits with soft spots or that show signs of molding. Choose oranges that are firm, relatively heavy and note that smaller oranges are usually juicier than larger ones. The benefits of oranges last as fruit is stored in a refrigerator or at room temperature for up to 2 weeks. To prevent molding, they should never be stored in a plastic bag. Easy to peel and eat, you can receive orange nutrition while enjoying a delicious snack, whole, juiced, or blended into a fruit smoothie.